WASHINGTON (CNN) -- The House of Representatives on Tuesday formally admonished Republican Rep. Joe Wilson for shouting "you lie" during President Obama's speech to a joint session of Congress last week. He and other Republicans noted that Wilson apologized to Obama immediately after the speech, and that the president accepted it. Asked after the vote if he apologized privately to House leaders such as Speaker Nancy Pelosi, Wilson told journalists it wasn't necessary. "In my view, by apologizing to the president, the most important person in the history of the world, that applied to everyone," Wilson said. However, House Majority Leader Steny Hoyer, D-Maryland, said Wilson's refusal to apologize to the House for his disrespectful behavior to the chamber required admonishment. 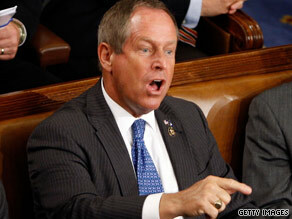 Commentary: Why the shock about Joe Wilson? The issue, he said, "is whether we are able to proceed with a degree of civility and decorum" that Congress requires. The House resolution was the mildest form of discipline the chamber can exercise for misconduct on the House floor. "Whereas the conduct of the Representative from South Carolina was a breach of decorum and degraded the proceedings of the joint session, to the discredit of the House: Now, therefore, be it resolved that the House of Representatives disapproves of the behavior of the Representative from South Carolina, Mr. Wilson, during the joint session of Congress held on Sept. 9, 2009," said a text of the resolution posted earlier on Hoyer's legislative Web site. Before debate on the measure began, one Democrat said the disrespect shown Obama by Wilson never would have happened to a white president. "No president has been subjected to that type of treatment on the floor of the House of Representatives, and if we go down that road, then it's the law of the jungle, and I think that's just wrong," said Rep. Gerry Connolly of Virginia. However, House Minority Leader John Boehner of Ohio called the resolution "piling on." "The American people want less politics and more jobs," said Rep. Mike Pence, R-Indiana. In closing the debate, Democratic Rep. James Clyburn of South Carolina, the House Majority whip, noted that all Americans, especially schoolchildren, learn about civics and government by observing the House. Clyburn, a former schoolteacher, said failing to enforce House rules against Wilson's outburst would send the wrong message. The House Democratic leadership agreed to move forward with the vote after meeting to discuss the issue Monday evening, according to two Democratic leadership aides. Kristie Greco, a spokeswoman for Clyburn, said the discussion at Monday's meeting was about "how this speaks to the breach of decorum alone, and not addressing the issue sets a precedent for bad behavior." Wilson on Sunday described his loud retort to Obama's statement that illegal immigrants would not be covered under the Democrats' health care bill as "a town hall moment." But he made it clear he would not apologize on the House floor. "I called immediately, I did apologize, but I believe one apology is sufficient," he said. Last week, House Speaker Nancy Pelosi called the episode "unfortunate" and told reporters at her weekly news conference, "It's time for us to talk about health care and not Mr. Wilson." But when Pelosi met with Democratic leaders later that day, her colleagues argued that unless Wilson apologized on his own, they would want a formal vote on a resolution of disapproval, according to several Democratic sources. On Tuesday, Pelosi refused to comment on the resolution to reporters outside the weekly Democratic caucus meeting, saying that journalists should be focusing on the health care reform issue. Other Democrats offered their thoughts. Johnson said Wilson's comment amounted to a "wink" of approval to right-wing extremists who have brought highly charged language and imagery -- such as posters depicting Obama with a Hitler mustache or as an African witch doctor -- to the health care debate. "He [Wilson] did not help the cause of diversity and tolerance with his remarks," Johnson said. "If I were a betting man, I would say that it instigated more racist sentiment feeling that it's OK -- you don't have to bury it now." Johnson added that failing to rebuke Wilson would bring increased racism in the public discussion on health care, saying: "You can bring it out and talk about it fully, and so I guess we will probably have folks putting on white hoods and white uniforms again riding through the countryside intimidating people." "That's the logical conclusion if this kind of attitude is not rebuked, and Congressman Wilson represents it," Johnson said. "He is the face of it, and that's why I support the resolution." To Rep. Jason Altmire of Pennsylvania, a member of the moderate Blue Dog Democratic coalition, the issue was simple: "He has not apologized to the House for the embarrassment he brought" to the chamber, Altmire said. Democratic Rep. Barbara Lee of California, a leading member of the Congressional Black Caucus, said Wilson's violation of House rules was "egregious enough that it warrants an apology on the floor." Without that, the resolution of disapproval is called for, she said. On the Republican side, Rep. Steve King of Iowa began circulating a letter among House Republicans last weekend urging Wilson not to apologize on the House floor. The letter stated, "We urge that you hold your ground against those who seek partisan advantage and reject all demands for additional redress. When the president of the United States accepts an apology, no observer has an additional claim." CNN's Deirdre Walsh and Lisa Desjardins contributed to this report.